He was born Syhlet District, Bangladesh. Member of Painters Orchestra, Calcutta 1984, 99 Published papers on Nandalal Bose and on art education published in the journal of the Faculty of Visual Arts, Rabindra Bharati University, Calcutta. 1994 Poems on Drawings, poems by the poets of Calcutta on drawings by the members of Painters Orchestra, Calcutta, a silver jubilee publication of painters Orchestra, Calcutta. 1996 A special feature on Art works on and with the pages of SPAN by Art critic Mr. Kishore Chatterjee and published by SPAN Feb./March issue. Lives and works in Kolkata. Completed his B.A., Calcutta University, Calcutta. 1966 Diploma in Fine Arts and Craft, under Ramkinkar Baij and Benode Behari Mukherjee, Kala Bhavan, Santiniketan. 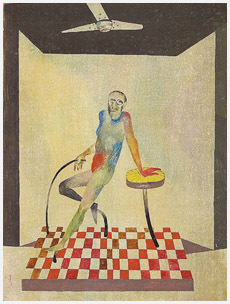 1968 Post-Diploma in painting, under K.G. Subramanyan and Jyoti Bhatt, Faculty of Fine Arts, Maharaja Sayajirao University, Baroda. Since 1968 Group shows every year with Painters Orchestra, Calcutta. 1970 National Exhb., Lalit Kala Akademi, New Delhi. 1974, 76, 78, 81, 97 Solo exhb. in Calcutta. 1986 A Folio of Etchings, organised by the members of the Faculty of Visual Arts, on the occasion of the 125th birth celebration of Rabindranath Tagore, Rabindra Bharati University, Calcutta. 1997 Movement of Indian Art 50 years of independence, Chitrakala Parishath, Bangalore. 1998 Fabric sculpture, organised by the Faculty of Visual Arts, Rabindra Bharati University, Calcutta. Contemporary Artists from Bengal, Ajah Gallery, Singapore. Participated in the Metropolitan Art Festival, Calcutta. 1998, 99, 2000, 01, 02, 03 Annual Exhb., Birla Akademy of Art and Culture, Calcutta. 2000, 01, 02, 03 Group show, members of the Faculty of Visual Arts, Rabindra Bharati University, Calcutta. 2001 Works on Paper, CIMA Art Gallery, Kolkata. 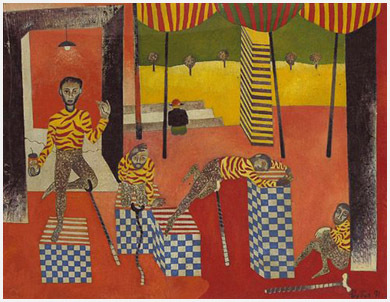 2001, 02, 03 Annual Exhb., Academy of Fine Arts, Kolkata. To Partha Pratim Deb, the connotation of visual creativity does not hold on to any `ism` or style, but is an outcome of creative playfulness that is arrived at spontaneously, as part of an ongoing process of introspection and submission. To him, the sterilized sanctity of a medium finds no significance. Rather, he explores and experiments with the endless repertoire of discards, shifting and recycling them into a pictorial language. Thus he translates his ideas into multiple hybrid forms and interesting metamorphosed images, an approach that often synthesizes the disciplines of painting. He was the Professor in painting and Dean, Faculty of Visual Arts, Rabindra Bharati University, Calcutta.